According to the legend, when Buddha reached enlightenment he invited all the animals to celebrate their joy. 12 animals accepted that invitation, and one of them was the Dragon. As a prize, the 12 animals became, thus, part of the Chinese zodiac. Chinese Astrology is one of the oldest known and the case of the Chinese Horoscope is especially striking as we can be an animal or another depending on the year in which we were born, but we also can be another depending on the month and the time of birth. How do I know if I am a Dragon? As we have indicated before, each animal ‘governs’ a specific year. 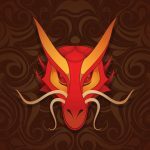 The years of the Dragon in the Chinese Horoscope are: 1904, 1916, 1928, 1940, 1952, 1964, 1976, 1988, 2000, 2012 and so on, adding 12 years to the previous figure. The dragon is a large animal, glorious and full of vitality and endowed with an extraordinary courage. In the Chinese Horoscope, they have always been associated with good luck. In his story there is a lot of mythology that helps to increase curiosity about his figure. They are independent people who need solitude to be able to feel full. They are born winners: People born under the sign have a strong attitude and innate talent. Energetic: A Dragon is endowed with an incredible energy that make him be involved in many activities. This energy is also translated into an infinite enthusiasm for life and for its small pleasures. Friendly: Regardless of their strength, they are people who like to make their flag friendly. People born in the year of the Dragon with the flow of the water element in the Chinese Horoscope are generally idealistic and have a lot of self-confidence. They are usually involved in professions that help to build a fairer world. People born under the influence of the Dragon with the wood element are sophisticated and full of style. They generate admiration and, in a way, everyone wants to look like them. In the Chinese Horoscope, people with influence of this element are the most jovial of those born in the year of the Dragon: fun, friendly and charismatic. The earth element gives them some realism and also makes them more traditional and conservative. People born in the year of the Dragon under the influence of this element become, somewhat, more eccentric and provocative. Even so, they retain that natural charm that only Dragon has.